Getting out and about during Visa Wellington On a Plate doesn’t mean you have to throw cash around like you’re in a hip-hop music video. There are plenty of low-cost options that’ll let you stretch your VWOAP budget a little further. When it comes to Dine Wellington, a Festival Dish can be cheaper and is definitely tastier than a golden arches combo (if only they could be served at 3am for some of us...). These folk all have a Festival Dish plus local beverage for $15: Carrello del Gelato's got pizza for days; Grill Meats Beer is grilling pork fillet or Coq au Vin chicken; Kanteen have a fish finger buttie or open steak sammie; try deciding between Mishmosh's grilled cod or slowroasted pork; Siglo's got vegetarians covered; as do Southern Cross with a meatlover or vego friendly hotdog; Tequila Joe's serving up the chilli; Furnace's meatballs with sauerkraut; and Beach Road Deli have also jumped on the pizza bandwagon, plus the drive up the coast is nice. There's a whole bunch that have a Festival Dish plus beverage for $25 if you've got a tenner to spare. Don’t let your lunch slip through your hands at The Cuban Air Raid sandwich drop. Grab some authentic Argentine street food at El Matador’s Argentine Street Food Fiesta. 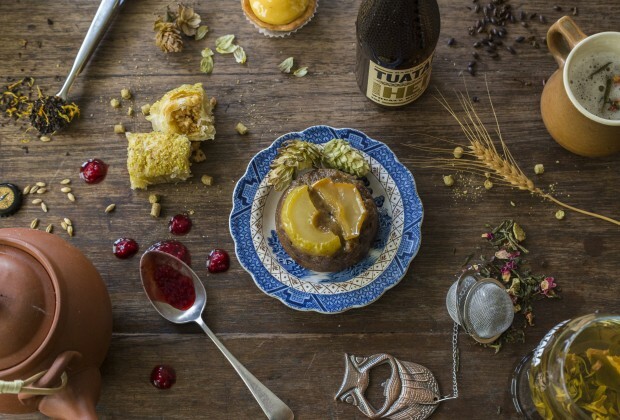 Brewed: Tea by Tuatara brings high tea and beer together with new and classic Tuatara beers matched with delicious sweet treats (limited tickets available). Together We Grow presents a garden-to-table lunch using produce grown in a community garden at Epuni Primary School to help with food education. And don’t forget about the pop ups! All are free entry and pay on consumption, so you won’t have to spend much at all to get yourself something to hit that hunger spot. Going down the cheap route doesn’t mean you have to sacrifice quality or experience, as these three burgers I’ve tasted prove. 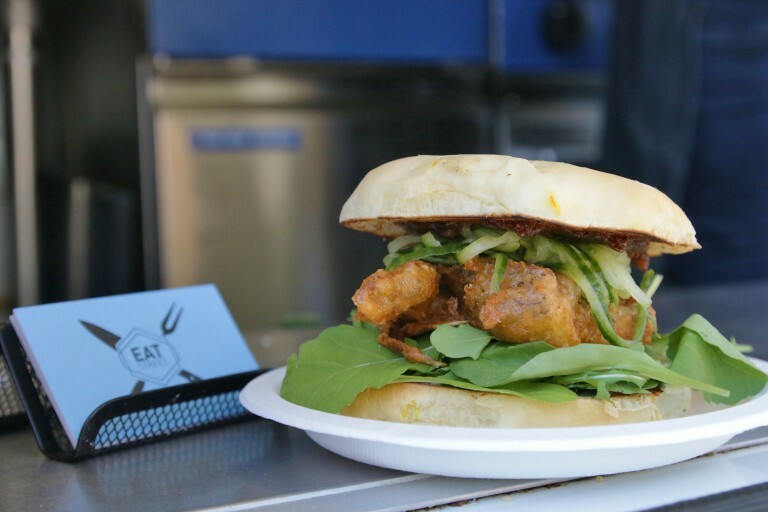 Eat Street are one of the food trucks that has joined this year’s Burger Wellington line-up, hard to miss in their gorgeous sky blue van and for Burger Wellington they’re serving The Crusty Crab – soft-shell crab with chilli jam, wasabi mayonnaise, lime cucumber and rocket, housed in a saffron milk bun. This burger packs in lots of fresh flavour and won’t hurt your bank account balance at just $16.00. Personally, I prefer soft-shell crabs over the harder variety – they’re the best (read: lazy) way to eat crab. No need to deal with silly tweezers here! Eat Street cook their crabs to perfection in a lightly spiced batter with a hint of lemongrass. The crab is crisp but is still firm to the bite, and it’s so fragrant and so fresh. The homemade chilli jam is sublime and adds a hint of sweetness and clean spice – it reminded me of Thai nam phrik. Lime cucumber and fresh rocket add tang and peppery zest. You’ll find Hillside Kitchen and Cellar tucked away on Tinakori Road. Owner and chef Asher Boote and his team draw inspiration from multicultural modern New Zealand, offering simple but stylish food in a casual and relaxed atmosphere away from the chaos of the city. 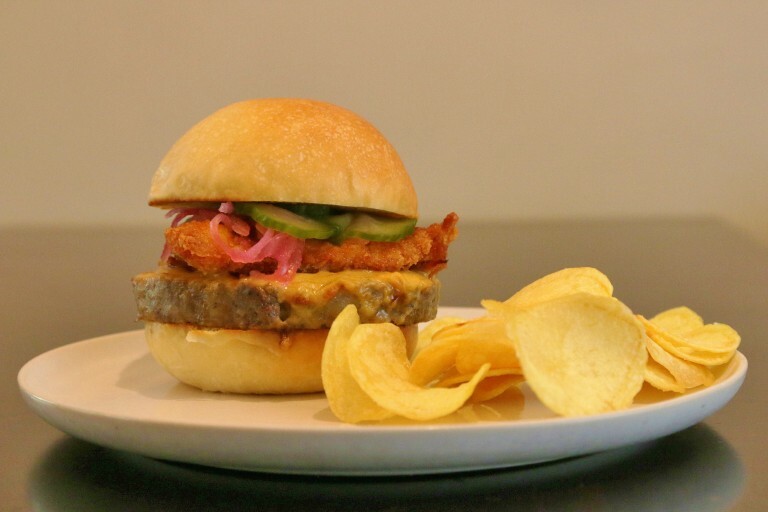 Hillside’s Pigesus burger (the name affectionately given to the pig on the wall of Hillside’s sibling joint The Ramen Shop) brings pork and chicken together with legendary results. There’s the aforementioned bacon (baked into a blue cheese rarebit), a slab of pork terrine, panko-crumbed katsu chicken, pickles and a Southern-style hot sauce (both house made). It’s all encased in a dinner roll that has mashed potatoes mixed into its dough to help retain moisture and give it its soft, fluffy texture. There’s a lot going on in this burger – both texture and flavour-wise – but the end result is well balanced, like eating a bánh mi. The robust terrine acts as a substitute for the pâté and is the glue that holds everything together. Special mention must be made of the hot sauce, which starts off gentle before warming up into a deeper heat. It’s the perfect foil to the hardy savoury flavours of the burger. Also, the accompanying kettle-style potato chips (also house made) are spot-on. Another seriously great burger for just $15. 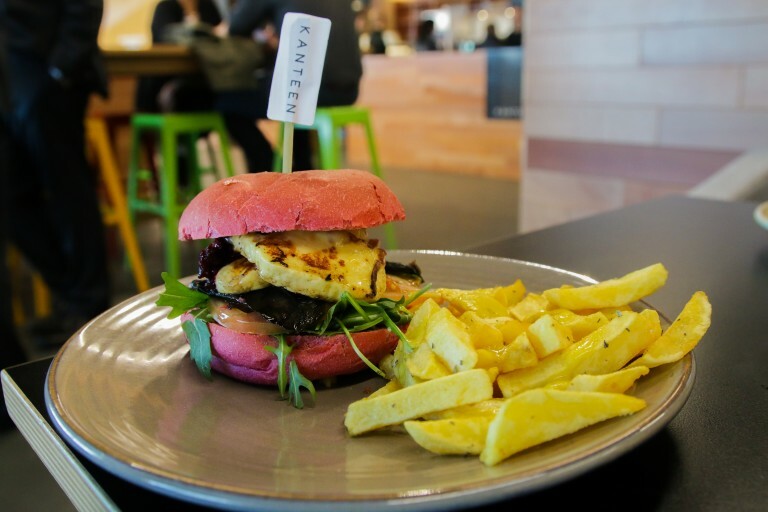 Grab yourself a helping of Greek chic with Kanteen’s vegetarian My Big Fat Greek Burger. Don’t adjust your sets – the bun really is that startling pink colour. Nestled on the ground floor of NZ Post House on Waterloo Quay, Kanteen is open to the public from Monday to Friday and was pumping when I visited with plenty of diners tucking into this excellent burger. What I like most about this burger is that the flavours of each component are distinct but still play nicely together: tender whole Parkvale mushrooms, generous slices of salty halloumi, beetroot relish for a touch of sweetness, and rocket and tomato for a clean finish. It’s a perfect lunchtime burger and great if you’re looking for a lighter meat-free alternative. And the Greek fried potatoes – oh my Zeus. They’re exceptionally moreish with a light dusting of lemon pepper and a tangy mustard dressing. Also, the $18.50 price tag gets you the burger and a cold drink (kombucha or juice)! Now that’s a deal you can write home about. Opa! Other Burger Wellington entries that come in under the $20 mark include Plum’s Coq au Vin buttermilk chicken burger; Mish Mosh’s poached crayfish burger; The Ramen Shop’s Umami Burger with a pork and beef patty and foraged seaweed; Mexico’s Guajillo Pork Torta featuring pork and cumin-spiced frijoles; Siglo’s pulled pork, and apple and beetroot chutney burger; Monterey’s Tall, Dark and Sassy smoked brisket burger with candied pork belly; Antojitos Taco Truck’s Chick N Chippie Sammich; Supply Room Kitchen’s Prawn Star burger; and Carello Del Gelato’s dessert burger.